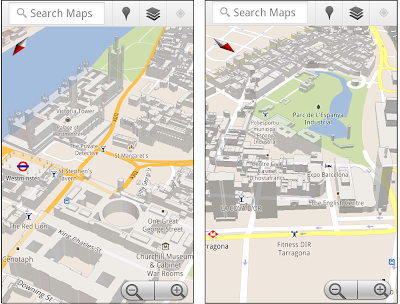 3D London and Paris on the Google Maps Mobile - gives users a more realistic sense of location and bearing. Now, 3D buildings are available in London, Paris, Barcelona, Stockholm, Singapore, Lisbon, Boulder, and 11 major cities in South Africa. These buildings will appear in both Google Maps and Google Maps for mobile.